Tom and Wendy Kreutner relocated to Portland from Southern California in the late 1970’s. In 1983 they purchased an old 52-acre cherry orchard intending to plant their own vineyard. The property was located in the Chehalem Mountains near Adelsheim Winery. Twelve acres were planted. The Kreutner’s used the Geneva Double Curtain trellis system, which at the time was unique to Oregon. A small winery was built and winemaking duties shared between the Kreutner’s and a group of loyal friends. Autumn Wind’s first vintage was 1987. Small quantities of Pinot Noir, Chardonnay, and Riesling were produced. Some grapes were sold to Rich Cushman for his Viento label. Autumn Wind was located at 15225 North Valley Road, Newberg. 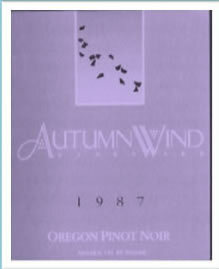 In the 1990’s Autumn Wind Vineyard was sold to Patricia Green Cellars.